I’ve been thinking a lot lately about what brings me joy in my teaching life. Joy, by definition, is a source or cause of delight. I think back to my favorite teachers as a child, and it was clear that they found joy in teaching. I’m sure they had many of the same stressors that teachers today have, and yet, they remained joyful in spite of it all. Today, teachers are challenged daily with a zillion things that don’t hold a lot of joy, and in fact, some can be downright spirit crushing. But it’s up to us to create joy in our teaching lives, and share that joy with our kids and our colleagues. Here are five things that bring joy to my teaching life. Sharing a new book with kids. I love books, and I love sharing books with kids. This week I shared a Piggie and Elephant book (We Are in a Book! by Mo Willems) with a class of first graders. Their laughter and excitement as I read the book was fabulous. They had such a hard time staying “criss-cross applesauce” on the rug – they wanted to stand up and get closer to the book. And when I said they could find more of this series in the library they cheered. Seeing kids this excited about books and familiar authors is truly joyful! Inquiry. As a learner, I am most engaged when following a topic that I am passionate about and have a personal interest in. Inquiry projects with kids encourage questioning and allow them to pursue learning that directly relates to their lives. There is much joy in seeing a class constantly questioning and experiencing learning by co-constructing an evolving curriculum. Writing with kids. Teaching within a Writer’s Workshop is an amazing thing. I love how excited kids get when I share a new writer’s technique with them or when we discover something together about an author’s piece. I’m always impressed with how bravely and fearlessly young writers try on a new technique and play with it in their own writing. Sitting side-by-side with a writer gives me an opportunity to connect with that child and his or her writing and see the possibilities that hide within each writer. A child’s writing is something to celebrate and find joy in. Play. I believe in the importance of play. 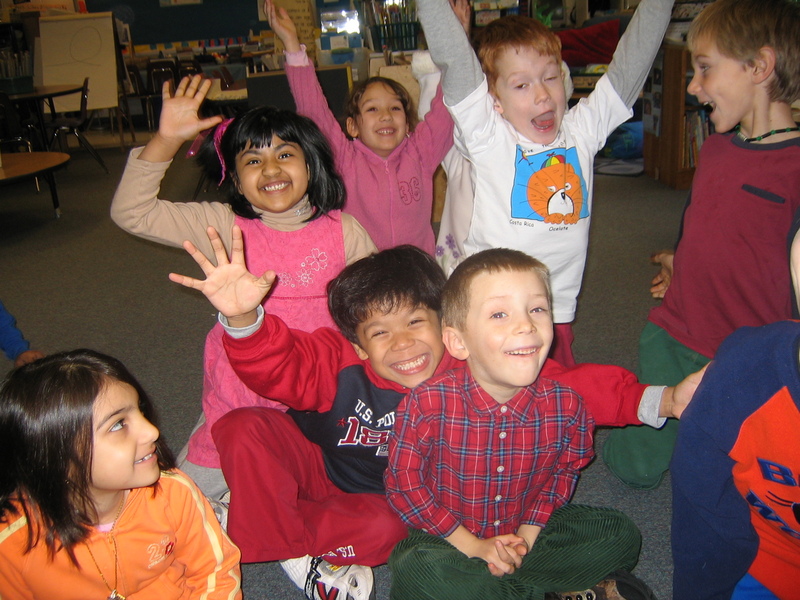 Through play we can learn so much about each other, the curriculum and ourselves. When we are playful, it is difficult to get upset, stressed out or cynical. Play should infiltrate our teaching lives (as well as our personal lives!). Kids. Kids bring joy to my life. The hugs, the funny things they say, the way they light up when they figure out a tricky part in a book or publish a story or solve a challenging math problem or discover a spider web on the playground. My life wouldn’t be complete without a daily dose of kid joy. What brings joy to your teaching life? Conferencing with my students brings me great joy! Today, my hater of reading is almost a lover of it! He knew, remembered, and had practicing towards his goal of fluency and brought tears to my eyes as he shared how he has been doing. I was super impressed. Can’t wait to see what the next few months bring for him! It brings me great JOY in teaching to watch our students improve a great deal from Kindergarten to 4th grade. I am so amazed at the great growth some of our most struggling children make from the time they enter school at age 5 to the time they leave us 5 years later. Today I viewed my students’ photostories. These are digital stories of ” a day in my life – the story of a Pilgrim boy” (or girl). This is the benchmark assessment and is usually paper/pencil – but why not let second graders use technology. I listened to boys and girls tell their story (with self- made sound effects and commentary!). But the best was the little boy who didn’t realize the microphone captures everything. About 4 pictures into the story he says, “This mic is so last year. I’ve had to say things like ten times!” and by the next picture he is back to narrating his pilgrim day. I shared it with everyone who wondered by my classroom, laughing. Joy comes in being able to laugh with colleagues. Joy comes in remembering how honest children are and how proud they are of their accomplishments. I can’t wait to tell them how thrilled I was with their work! About ten years ago this came to mind . . .
Is but a letter; which will you choose today? It’s helped me many days to reach for the joy in the depths of the teaching job. Really glad to find your site!